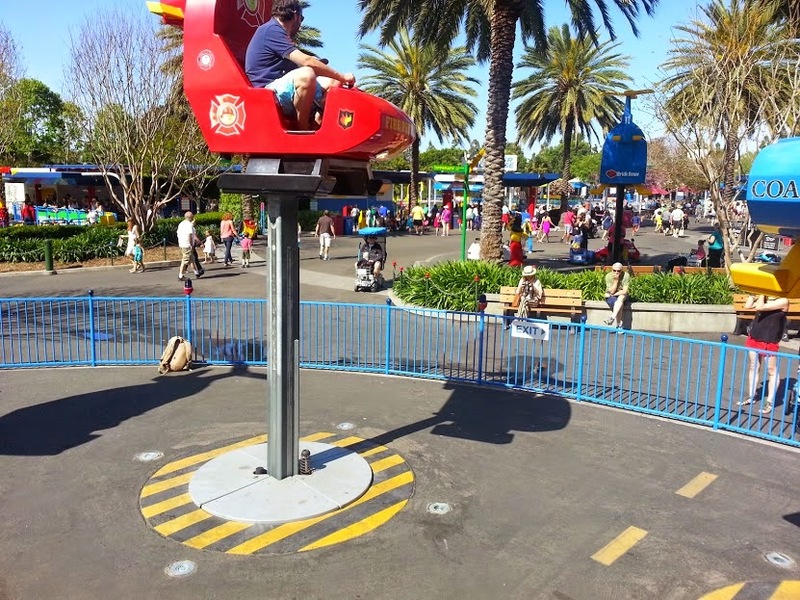 We took our family of five to Legoland California for the boys’ fifth birthday in April, 2015. We had my folks and sister with her family along for the fun so we ended up with a group of TEN for our vacation. It was A BLAST! I am so glad we invested the time and expense for the vacation, it was so wonderful and turned out better than I anticipated. 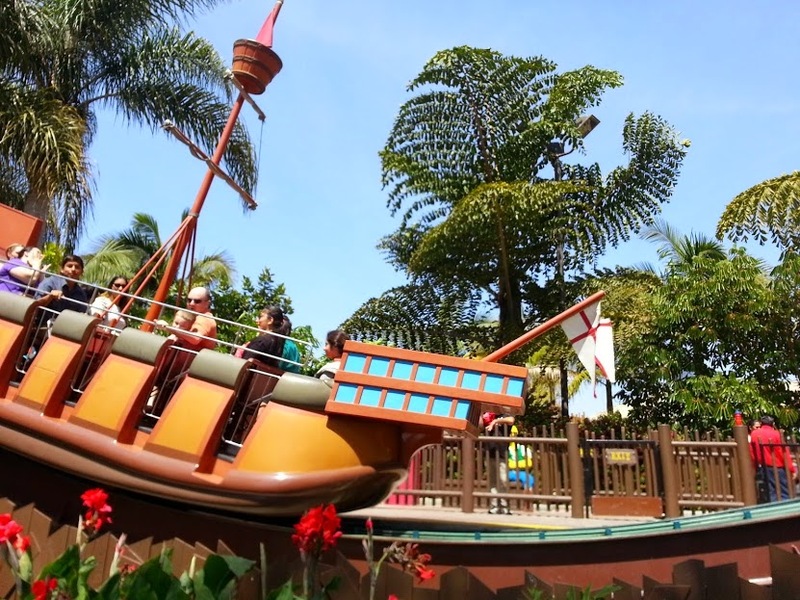 People kept asking us why we didn’t do Disneyland but I knew this park would be perfect for our group including four kids ages five and younger. Disney has so much to offer for big kids and adults but Legoland is perfect for the eight and younger set. And perhaps, just the right speed for adults who aren’t crazy about roller coasters. 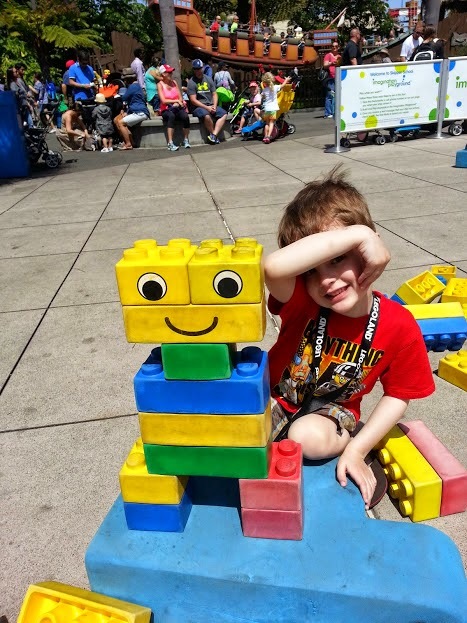 You don’t have to be a Lego fanatic to enjoy the park but it certainly amped up the experience. There were so many Lego details all over the park, the boys had fun shouting out all the stuff they could see built with Lego. Since we were flying from Washington I figured it would be the only time we’d do Legoland (when the kids are older we’ll be ready for Disneyland) so I wanted to go all out. 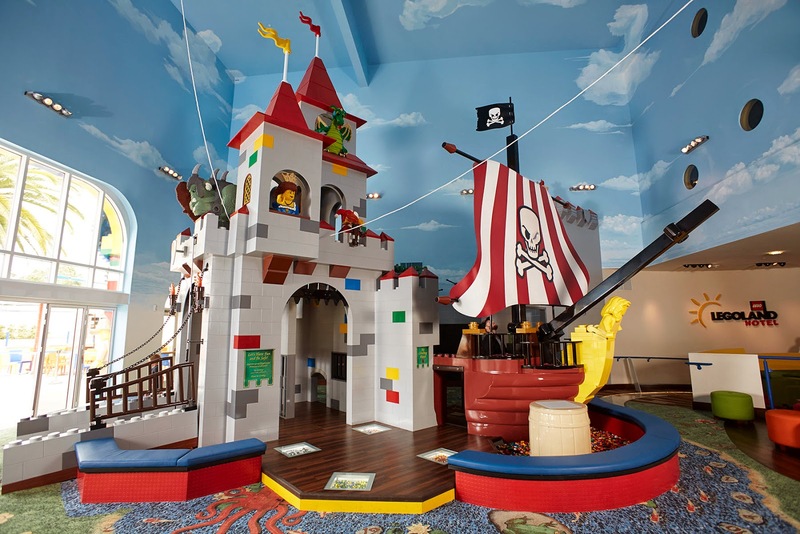 We spent the extra money and stayed at the Legoland Resort hotel. The hotel rooms are easily twice the cost of other hotels in the area but boy did the extra perks and amenities make up for the cost difference. After staying there I can easily say it was worth every penny and I highly recommend it to anyone traveling with children. We booked our trip through a friend who just happens to be a travel agent and she snagged us a deal for two day resort hopper tickets included in the price of the room. It worked out great because although we’re a family of five, Alice was in the free admission age group for getting into the park, so we only needed four tickets included in the hotel booking. Upon walking into the hotel I was blown away at how much the entire place is catered to kids. There were Lego displays at knee level at the checkin desk so the kids had something fun to look at while grown ups check in. There’s a hug Lego pit just steps from the checkin desk and lobby entrance which was a great spot for kids to play while groups were gathering for checkin, meals or leaving the hotel for the day. Miles had so many questions about the gal that was sitting there playing with the kids (she was an employee) he thought it was pretty cool to have a job where you get to sit and play with Lego all day. Up a ramp and around a wall from the lobby there is an awesome play castle which made for a great run around spot. I think Alice used this spot more than any of our kids. She would run, run, run in circles and go in and out of the castle. There are duplo blocks to build with, a pull “rope” to make the castle ogre roar, a wheel to spin, little door ways to walk through and chalk boards to write on. It was the perfect spot to run off energy when the kids needed to get rowdy. There’s a walk up counter cafe next to the castle and the side wall had a display of all the Lego scenes from the ending credits in The Lego Movie. I had fun looking at those up close. There was nightly entertainment including a movie by the pool, pajama party in the lobby and staff putting on comical performances. I missed all of that because I stayed with Alice to get her to bed but Joel took the boys to the pj party the first night and said they had a great time. The hotel also has three restaurant options for catching a meal or snack. Their wonderful staff didn’t even bat an eye when I asked for FIVE extra bath towels and they always talked directly to the kids when they were in tow. It was fun to be at a hotel where the kids were treated like people instead of a nuisance or hassle. But, be forewarned. Kids definitely outnumber grownups at the hotel. There were kids EVERYWHERE and the noise to go with it. I didn’t mind because with three of our own we just blended in to the commotion but if you’re looking for a quiet retreat – this is not the place to get it. Our group ended up with my crew in one room, my sister’s family of three in a room next door and my folks at a separate hotel off site. My parents had some extra running around to do each day for meeting up with us but at least they had a spot to get away from KIDS. Breakfast was included in the price of our room and the buffet restaurant had a phenomenal selection of foods. I didn’t get any pictures because we were always busy getting three kids fed but there’s a kid height section of their buffet line which was a fun experience for the boys. This was also a great chance for us to fill up our water bottles for the day and fill sippy cups of milk for Alice. The other major perk of staying at the hotel was getting into the Legoland theme park an hour ahead of the general public. This is a feature not to be ignored! We took the advice of other bloggers and booked a hotel room on the third floor which is the top floor. It gave us a room without kids running over head and a longer ride on the super fun disco elevators. There is a whoopy cushion feature in the floor next to the elevators and although some were annoyed by it, I thought it was genius. We could say “Meet at the whoopy cushion!” and it gave the kids motivation to get out of the hotel room and gather as a group. The hotel room itself was basic but TOTALLY Lego themed out. Every inch of the room had lego details and it was pretty neat seeing the kids marvel at all the lego sculptures. The room had a bunk bed with a trundle bed below and the boys loved it. There’s a tv in the kid area which was nice when we wanted to let the boys zone out while we got Alice to bed in the pack n play in our area. We requested a pack and play ahead of time for Alice and it was waiting in our room when we arrived. Bring your own sheet for the pack and play, there isn’t one included. A little hallway connects the kid area to the bed room for adults; there’s a bathroom off to the side with a sliding door. We were pretty cramped in the room with our group of five. I was so thankful to have packed the kids clothes well as there was definitely not enough storage space in the room. I was grateful to have a mini fridge in the room, a definite must when traveling with little kids and there were bottles of water and juice that were replenished each day and included in the room amenities. I laid out all the kids’ clothes before we left and packed the boys’ outfits one per ziploc bag (shirt, shorts and underwear) and labeled it with their name. Then in the morning we could say “Grab one of your clothes bags and get dressed.” It definitely cut down on how many clothes were thrown all over the hotel room, kept our clean clothes separated from the dirty ones and helped keep our suitcases contained. Each room comes with a treasure hunt lock box and you can complete a scavenger hunt to find out the code to open the box. Every day we had three new prizes in our box, that alone was worth a bit of money! We had three packs of Mixels in our room each day the room was cleaned and those things are easily $5.00 each back home. That was a nice touch. I had read about the treasure hunt but didn’t know we’d get new prizes each day. Miles ended up using the box for storing all his Lego creations (to keep them away from Alice’s hands) and he had quite the little diorama scene by the end of our trip. The Legoland California Resort has a wonderful pool with a zero depth entry. This was our first time to a pool where we didn’t have to hold the boys the entire time and it turned our usually stressful pool trips into a relaxing hang out spot. Alice could have fun walking and splashing in the water with Daddy near by and the boys could go a little deeper and have fun playing. The pool also has a deep end which we never bothered with because our kids are younger. It was nice for the bigger kids at the pool to have their own area to swim, cannon ball and make noise while our tots were on the smaller side. Separate pool towels are available at the pool to use but there were a few times they were all out and I had to run back up to our room to bring down hotel bathroom towels. There were cabanas for rental but we never needed them because there were plenty of lounge chairs available. The Legoland website talked about their floating water Lego which had Miles really excited to build Lego in the water. There was definitely not as many Lego as the website made it seem. There were a few bricks here or there and Miles spent a lot of his time trying to gather them up. If was kind of funny. It was a fun feature but definitely not enough to actually build with. We checked in to our hotel on a Wednesday afternoon and spent the day enjoying the hotel and getting settled in. We had dinner at the Skyline Cafe on site which was decent. Our bill was HIGH but I think that was mostly due to the $10 beers us grown ups splurged on as a treat for surviving our first vacation day. Meals could easily be split between people – even the kids meals were huge. Then our plan was Thursday in the park, Friday split between the water park and regular park and checkout was Saturday afternoon. It was the perfect schedule for our group. There was PLENTY to enjoy at the hotel that the kids were never bored and the grown ups had a chance to unpack and regroup without feeling like we had to rush off to the park and not miss out on anything. My mom bought the boys’ some lego shirts and pjs before our trip and I saved them as a surprise for when they were getting dressed in the morning. It was a fun surprise and they LOVED having Lego gear to wear while we were there. The same as Disneyland, buying your Lego gear ahead of time can save you big bucks over the prices of things inside the park. Plan your path before you’re at the park. With strollers and little kids everywhere it’s hard to get through the park very quickly. And if you’re one of the groups with strollers and little kids you won’t be moving very fast either. It was nice to stroll along and take time to look at everything but you’ll need that walking time planned in to your day. If you look at the map ahead of time and note which rides you want to prioritize you can plan the best route for getting around. Unless you REALLY love your stroller, just rent one at the park. We were traveling with three car seats so I didn’t want to also lug our stroller along. I babywore Alice at the airport and the boys walked. We budgeted to pay for stroller rentals at the park and BOY was I happy with them. Even better for what we needed than our own stroller would have been. The kids could easily hop in and out, there was a sun shade, places for water bottles and a little bit of storage we could use for gear or laying out our map. They were surprisingly easy to steer and had a smooth ride. Even our five year olds enjoyed hopping on and having a ride when we wanted to move a long distance. Plan in bathroom breaks, water breaks and breaks in general. If you’re there when it’s HOT you don’t want your kids getting dehydrated. Don’t forget to feed them either. A tired, hungry, thirsty kid makes for a cranky kid and no one wants a cranky kid on their hands. Also be sure you look at the map and spot the bathroom locations so you can plan for pit stops. Pack in your own snacks and water. We brought a backpack and brought in our own water and snacks which helped for refueling on the go. It also avoided a few meltdowns when we could tell our kids were getting hungry. Pack layers and bring travel sunblock. I had read to bring along a change of clothes into the park so that when your kids get wet you can change them. We never needed this tip, but maybe if your kids want to do more of the thrill splash rides it would be necessary. What I didn’t anticipate was that my kids would whine about being chilly. The first morning they were both in t-shirts and shorts and wanted their hoodies (which were back in the hotel room). It was kind of annoying and I was sure to bring them along the second day. We sunblocked our kids in the morning at the hotel room and brought along one bottle to re-apply throughout the day when we were in direct sun. We also had a hat for each kid which they didn’t always want on so having the backpack to store them was helpful. Don’t rush your kids along. There is plenty to see and do and I don’t know how anyone can do the whole park in one day. We easily missed out on a good forth of the park (we didn’t even get into any of the Star Wars exhibits) and had two full days for our vacation. If you have several young kids in your group I recommend taking it slow, go at their pace and let them enjoy their vacation. A month later some of the stuff the boys talk about when we recount our vacation isn’t even on my list of the top five fun things we did – the factory tour, shopping in the gift shops, splashing in the water park – those are all things we could have easily skipped or rushed them through to move on to the next thing. If you’re in a group plan out meet up spots so you don’t have to worry about getting separated. Even with cell phones you don’t want to spend your entire time trying to track each other down. Have one or two checkin points for the day and make a plan so you don’t have to worry if your group gets separated. On the first day I called dibs on our lunch spot and later on we’d have a plan to send a text at a certain time to say where we were – then we could check in on how everyone was feeling and what they wanted to do next. It wasn’t realistic for our group of ten to stay together the whole time so this worked well for letting each family relax and enjoy the things they were interested in. Use the early entry time if you have it. This is not Disneyland. Ride lines aren’t run as efficiently as they could and the park can be hard to maneuver. Getting in to the park ahead of the general public can be a HUGE time saver to knock out a bunch of rides. But ask for details ahead of time. On the day we got in at 9am the Fun Zone (where we headed first) didn’t open until 10am so we had to back track and find rides we could do to use up our time. If I had known this ahead of time I would have taken us a different route through the park. I’m not sure if different areas open at different times depending on the time of year so research it before your trip to make the most of your early time. Our first day in the park didn’t start how I anticipated. With all the build up over our vacation (we had been counting down for months) I thought we’d be up and at ’em and first in line at the park. Well, we had let the boys stay up LATE building Lego the night before and they ended up sleeping in much later than I thought they would. I wanted them to be rested so I didn’t wake them early but finally got out of bed and started banging around at 8am so they would wake up. I was excited to get our vacation going! By the time we got our family of five sunblocked, dressed, fed and off to the park for the day we were not at the gate first thing. We didn’t make that mistake the second morning. You can definitely do way more rides in one hour of early entry than you can once it’s open to general admission and the crowds fill the park. Since we missed the opportunity to be first in line on any of the rides we picked up our stroller rental, checked out the maps and made a plan for which direction we were headed. Then Miles spotted the HUGE gift shop and immediately wanted to go check it out. Our group split up a bit and I stuck with Miles so he could browse and check out ALL THE LEGO there are to buy. In general the kits were comparable to what you could spend at home. Some things were more expensive some things were less. I didn’t see any kits in the stores that I couldn’t find online or back home but being in a shop that huge was a real treat for my preschooler. We had a deal with the kids that since it was their birthday we would match the money in their piggy banks and they could have a budget to spend how ever they wanted to. Graham kind of didn’t care. He wanted to buy stuff but once he had a few things picked out he was good. Miles was determined to spend every last dollar of his budget and wanted to make sure he got the most for his money. I did my best to not hurry him along and let him really take it all in. I kept repeating to myself “This is something he never gets to do back home.” and just kept walking with him through all the aisles of the store. I’m not sure what the rest of the group did with the time but Miles was in his own little world of Lego bliss. After Miles had his fill of the gift shops we met up with the group and jumped in line for our first official ride of our vacation – Aquazone Wave Racers (Green 79). It was FUN! But we didn’t pay attention to the length of the line when we headed over, we just followed the group and got in line. I don’t know the exact time but we waited at least half an hour. We used the time to chat and have a granola bar and raisins snack but it was kind of a waste standing in line. If I had known ahead of time we would have skipped it and looked for a ride with little or no wait. But since we were committed we made the best of it. Joel went with Graham and I went with Miles and I screamed and whoooped up the fun behind Miles while he laughed and turned the wheel as much as he could to move our racer in and out from the center while the whole thing spun in a circle. We got a little wet and it was fun! Alice was too little for the ride so she stayed behind with the grandparents and Auntie, looking at the miniland displays and waving to us from the waiting area. It was definitely sun hat weather! Once off the ride and back down with the group we walked the path over to the Build and Test and Duplo Play zones (Green 85, 86). I read about this attraction ahead of time and knew it would be a big stop for the boys. You get to build your own race cars and then run them on the ramp to test their speed. There were plenty of Lego to go around and the staffers gave out ribbons to the participants and winners of each official race. It was pretty cool. While the boys and Daddy were building and testing, Alice had a snack outside with Grandpa on a bench. We also worked in bathroom breaks and diaper changes. It was a good spot to catch our breath and take in the awesomeness of Legoland. Alice was beginning to get antsy right as we realized the Duplo area next door was open. The double doors were closed and no one was inside so I just assumed it was closed but when I pulled on the door – whala – we had the whole area to ourselves. There was Duplo to build with and areas you could push buttons to make different things move or activate different sounds. Although I wanted to let the kids enjoy themselves and not feel rushed we finally started pushing them towards the door around the forty five minute mark. We were an hour away from lunch and we had barely made it into the park! We continued on the way around the right of the park and jumped in a short line for Cargo Ace airplanes (Yellow 75). Another fun stop that I actually enjoyed myself. I’m NOT a roller coaster person so all the kiddie rides at the park were actually perfect for me too. I had planned on us having lunch at the Garden Restaurant (Red 49) which came recommended by several people. With quiet outdoor seating looking at the Miniland display and fresh healthy food choices, including wraps and salads, I knew it would be a good fit for our group. We had a bit of a trek to make it there from where we were and I didn’t want to take a chance of getting into whiny town so we loaded the kids up in the strollers and booked it over to the restaurant. My crew probably thought I was crazy about insisting we head for lunch at 11am but by the time we wove our way through the strollers and crowds, got our food and sat at tables, it was timed just right. The plan after lunch was for the grandparents to take Alice back to our hotel room for her nap but we had a bit of back and forth about who was going to go where. Some of our tots were acting tired and out of sorts so we thought maybe a bigger group should go back to rest. One of our boys was refusing to eat lunch and so we told him if he didn’t eat he’d go back to the hotel. We started to pack up and thought maybe three fourths of our group was heading back and then … then the kids perked up and ate, the parents chilled out and we ended up with the original plan. Grandparents took Alice, Sister’s family headed their own way and Joel and I took the boys in search of more rides. By this time I was starting to stress because it was nearly 1:00 and we’d only done two rides. I had to remind myself how big of a deal visiting the gift shops were for Miles and how much the boys loved the test track. But it was definitely time to re-evaluate what we were going to get done on the trip. We started looking at the map and thought we’d head over to some of the bigger rides to get those knocked off our list. Well, everything had a forty or more minute wait (the boat ride was an hour plus!) so we didn’t want to waste our time doing that. A pirate ship ride caught Graham’s eye and Joel and he ran to go get in line while Miles and I chilled out in a waiting area and he built with the water Lego for a bit. Miles with Lego dude, pirate ride in the back. I was surprised Graham wanted to do the pirate ride and thought he might chicken out when they got closer but Joel said he loved it! Captain Cranky’s Challenge (Red 43). 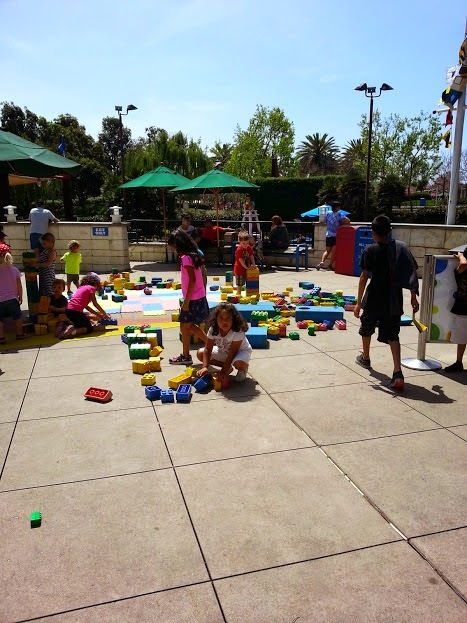 Legoland has kept kids in mind and has several spots that kids can play while parents wait in line. Miles thought this Lego shark was pretty awesome and loved examining it up close. After the ride we were getting pretty hot so we did more bathroom breaks and chugged some water. We walked through the fun town area and made note of the rides we wanted to come back to. Then we discovered the walk through factory tour which had some fun displays of how Lego are made. There was no wait and it was indoors with air conditioning, a perfect break from the sun. Lego Factory Tour (Blue 36). The boys got to use their camera to take pictures and the tour dumped you into a gift shop where the boys got to pick out minifigures and spend some more of their birthday money. Miles had a good time putting together minifigures to buy and there were fun minifigure accessories I hadn’t seen at our local Lego store. We were close by the Fun Town Stage (Blue 30) and there was a show coming up so we walked around the area a bit to check out other rides in action. Then we headed in to the amphitheater seating and enjoyed a slapstick show about trainees becoming fire fighters. There were catchy songs and plenty of stunts to keep the kids entertained. A definite must see for the 3-5 year set. The Lego Movie had a special attraction during the time we visited Legoland, complete with meet and greets at specific times for Emmet and Wyldstyle. I knew that would be a big stop for us, and maybe not one the rest of the group would care about, so we headed that way next. Transported and reconstructed at Legoland, you could examine the basement set from The Lego Movie live action scenes and the detail was amazing. The boys slowly walked through the exhibit pointing out all their favorite details. There were employees on hand to answer questions and provide scavenger hunt questions – like count all the Unikitties you can find. I didn’t really know what to expect but I was giddy about seeing the boys meet the life sized Lego dudes. The meet and great area was right next to a gift shop and Miles kept wanting to get out of line to go shopping. I was like “DUDE! Wyldstyle is RIGHT THERE!” There was a short wait, maybe five minutes to get to the front of the line for photos and the characters were really generous about their time with the kids. They’d give high fives and hugs and nod while the kids were talking (though I doubt they could really hear much of what the boys were saying). Graham was very adamant about not wanting his picture taken with the characters. I wasn’t sure what was going on, it was almost as if he didn’t want to turn his back to them. We waited in line for photos and when it came our turn with Wyldstyle, Graham waited on a bench while Miles had his picture. After the boys met Wyldstyle they went back into the exhibit with Daddy while I kept going in and out of the building to touch base with the rest of our group, buy some cold bottles of water and scout out when Emmet was going to appear. We didn’t prep the boys for meeting the characters other than talking about how it was a real person wearing a costume. They were definitely old enough to have that figured out on their own. But they still talked to the characters like they were real. It was pretty cute. Miles had his photo with Emmet and was itching to go shopping so he and I headed into the gift shop while Joel took Graham over to talk to Emmet. He was really stern with Joel about how he didn’t want a hug, he didn’t want a picture, he just wanted to talk to him. Joel helped interpret to Emmet since Graham was talking quietly. There was a little exchange between them for about two minutes. It was as if Graham had it all planned out in his head. He really just wanted a moment to have a talk with Emmet. Joel snapped a quick picture for documentation since Graham repeated for the fourth time that he did NOT want to pose for a picture. By this point we received word from the rest of the group that Alice was up from her nap and they were over at the Duplo Playtown. It wasn’t too far away so we wove our way through the attractions to meet up. The hardest part of the trip for me was wanting to do everything with all three of my kids. I was SO GRATEFUL to have my sister and parents along, not only to spend time with them but for all the help they gave us with taking care of Alice. She had her own mini-vacation and I was kind of sad to miss it. BUT I’m glad she got to have so much fun. 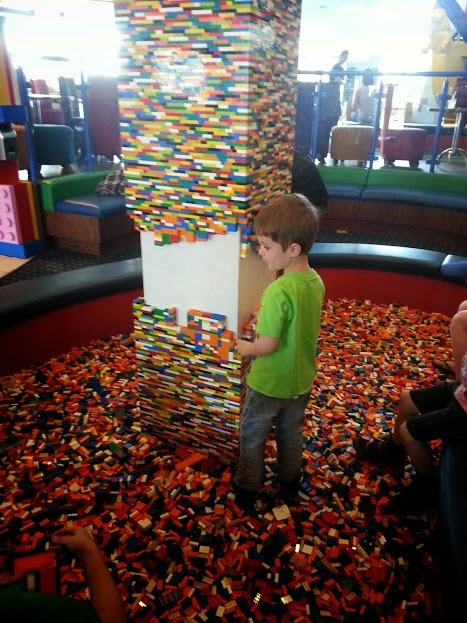 She LOVED Duplo Playtown (Blue 22) and I was impressed how much there was to do at Legoland for the smallest of tots. Big kids can go in the space too but it’s built with the littles in mind. There’s a tiny train ride that goes around a track. I don’t even know how many times Alice rode it. The area is themed out to look like it was built with Duplo blocks with several slides and climbers all at the perfect hight for littles. The whole area is enclosed with only one way in and out so there’s no fear of any kids running away and getting lost. There were benches for grown ups to take a load off and lots of little details to enjoy. I was really impressed with the space they set up. Once we were all back together we kicked around ideas for what to do next. Do we keep on, have dinner in the park and close the place down? We looked at the kids and looked at ourselves and decided not to push it. We gathered up our crew, made plans to have take out pizza at the hotel pool and made our way towards the exit of the park. It’s funny writing it out now, it doesn’t seem like we really did much that first day but with six hours on our feet in the park we were happy and we had our fill. I had read about the Dino Dig (Orange 8) attraction and how that was a fun stop for any kids that like digging in the sand so I suggested we swing by and see if that would be a nice final thing to do. Partial shade so we could be out of the sun and just let the kids dig and wander around while us parents chatted about the adventures we had while we were apart. Either shovels and buckets were now free or plenty of folks before us had left their purchase behind. I had read it was worth the extra money to buy a shovel and bucket but we didn’t need to! We were almost the only kids in the space and there were enough shovels and buckets for sharing and enjoying the dig. It also made for a good final stop because the kids were covered in sand by the time we pulled them out. We left the park around 4pm and headed back to our rooms, geared up into swim suits and made our way down to the pool. We found lounge chairs together and I walked over to the cafe counter and ordered pizzas for pick up. There were waiters walking around taking food and drink orders by the pool but they weren’t convenient enough when we were ready to order so I just walked over myself. The food was great, the price was right and it was the perfect wrap up to our night. Once back in the room we gave a few kids warm baths to get the chill out of their bones, jammied up and let them zone out to tv for a bit while we re-grouped. We ended up leaving the grandparents with the four kids while us middle parents dashed off to find a grocery store for beer and birthday cupcakes for the next day. The second morning of our trip I made sure we were up in time to get ready and off to breakfast with enough time to be at the park gates at 9am. My sister snagged the only picture we got the whole trip of all five of us in the same photo. Having breakfast at the buffet restaurant. The plan was Joel and I would take the boys on our morning dash through the park to catch at many rides as we could during that first hour before the park was opened to the public. Alice would stay behind with the grandparents and Auntie, Uncle and her cousin. It was a great plan and we did four or so rides in the time it had taken us to do one ride the day before – definitely worth the extra effort and coordination. We were at the front gates and able to see Emmet make the official park opening for the day and then we were OFF! We sprinted towards Fun Town to get in line for the driving school ride…. only to be stopped by a chain and employee blocking off the entrance into Fun Town. Turned out that only certain parts of the park was open at 9am and the rest opened at 10am when the whole park opened to the public. If I had planned better we would have figured that out ahead of time. I didn’t want to waste time trekking over to the other side of the park so we stuck close to Fun Town and hit up the rides that were open at 9am. We did the Sky Cruisers (Blue 23) pedal ride which was a fun way to see a lot of the park up high. And Uncle Curtis joined us for the Kid Power Towers (Blue 24) ride. A kid powered pulley that rotated and went up pretty high. It didn’t look like Fun Town was going to open early so we headed back to some of the rides we passed on the way in. We stood in line for five minutes for the Safari Trek ride (Orange 9) and snapped a couple pictures of us with the kids. Happy Birthday Miles and Graham! Then it was getting closer to 10:00 so I went over to Fun Town to scope out the situation and Joel stayed behind with the boys to climb all over Duplotown and had the place to themselves. There was a crowd gathering at 9:50 so I texted Joel to bring the boys over and after a few more minutes wait the chain was dropped and everyone was off and running. We were among the first in line at the Junior Driving School (Blue 28) and pep talked the boys on strategy while we watched the first group of kids do the ride. Then after some back and forth over wether they wanted to do the driving school ride again we skipped over to the Sky Patrol (Blue 25) ride and took a trip into the sky. While we were off running from ride to ride the girls stayed behind and did the boat ride Coast Cruise (Gray 87). They said it was a great way to see lego sculptures up close and the girls had fun taking a boat ride. After the Sky Patrol ride I left Joel with the boys to explore more of the fun town rides while the lines were short and I skipped over to the water park cabana stand to pick up our wrist bands and get the details on our cabana rental. It was good I didn’t have kids with me in the line. For some reason with only two people in front of me, it took a good fifteen minutes to get to the counter to be helped. Without consulting our group I decided to reserve a cabana for our day at the water park. I called the day before and booked it over the phone, and it’s good I didn’t wait until the day of – I snagged the last cabana in the tot area. I didn’t want anyone in our group talking me out of the splurge but I chalked it up to “It’s the boys’ 5th birthday, we’ll only be doing this once and it’ll be HOT in the sun with three generations in our group” excuse. For $140 we had a standard cabana for the day with in and out privileges. The cabana came with two lounge chairs, two regular chairs, a small table and best of all a mini fridge stocked with beverages (you could designate what you wanted among water and soda pops). The cabana came with access to waiter service and the food prices were the same as the walk up counters. Best of all we had a shady spot to hang out and store all our gear without having to spend time trying to save seats or corral loungers. Turned out no one in our group complained one bit about having a cabana and I highly recommend it to anyone on the fence about whether it’s worth the price! After getting our wrist bands I swung back to Joel and delivered his band and dashed back down to Duplo playtown to give the rest of our group their wrist bands. Then we planned for me to get back to our hotel room to pick up our bags we packed for the water park and meet the group back up to the park. I snagged a quick train ride with Alice and enjoyed a few moments of one on one time with her. It was a lot of walking but there’s no way we could have taken our whole group back to the hotel and then back up to the water park without wasting a ton of time. We planned to have lunch at the water park and since you have to bring your own towels that would have been too much gear to lug around during the first part of the morning. I dashed through the park with Dad and then we were back up to the water park with the rest of the group at the cabana getting ready to go get wet. We ordered some food and unwound while Mom took off to what we thought was a bathroom trip, and she came back a while later with her arms full of food she stood in line to get for us (she didn’t know about the waiter service at the cabana!). I felt bad that she had spent the time getting us food but we were VERY appreciative to have it and ate nearly everything she bought and we had ordered from the waiter. I didn’t bother with trying to get photos while we were in the water park – we splashed and explored the park. It was a bit crowded for my taste with three small kids in tow. But our cabana was right outside the Splash Zoo (Blue 9) area and we had a great time with the zoo, creek and safari areas. I ended up putting legging pants on Alice because she kept falling and scraping her knees on the rough cement. The cement was rough to provide traction and to keep people from slipping but if you have a new walker or a kid who falls easily they’ll find the ground rough on their knees and hands. Once she had the leggings on we were good to go. After sending my parents back to the hotel with Alice for her nap we took the boys over to the Chima section of the water park. It was pretty crowded and I don’t think we had much more fun over there. The boys splashed in the water and had fun doing the water guns but the slides were too big for their interest and the two family rides I had hoped we could go on had hour plus wait times so we didn’t bother. If you have kids under five and are going when the park is crowded I’d skip the Chima section and not waste your time with the crowds. We went back to the tot island area and finished up our time there. 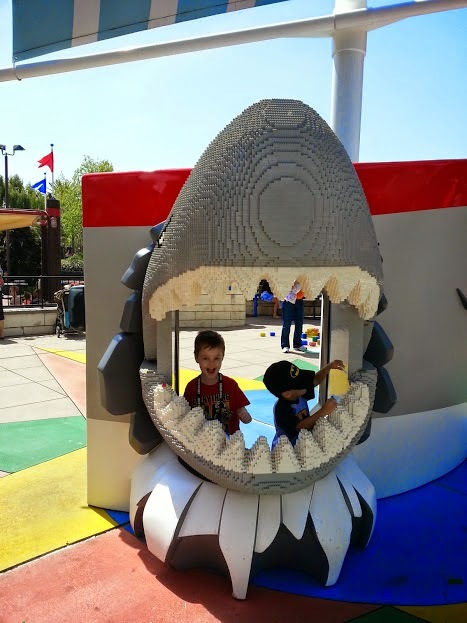 Then we had a decision to make – do we go do the regular Legoland park and plan to come back to the water park for more swimming or just pack up our stuff and call it good? We decided to not try to split our time up so much and changed out of our swim suits in the cabana. BUT the benefit of the cabana was we left all our gear (wet towels, suits and rented stroller) in the cabana and went to enjoy the park. We sent one of our group members back to the water park later to pick up all our gear and then they schlepped it all back to the hotel when we were done with our day. The last few hours of our time at Legoland was a bit of a marathon. I still had so much left on my list that I wanted to do. The kids were content but there were a few key things I wanted to try to hit up since we probably wouldn’t be back. There were a few showings of a 3D movie through the day and if we booked it we could take the boys to an unforgettable experience. We made it and they had a great time! Lego Showplace (Green 80) it was their first time seeing such a large screen and they had never experienced a 3D movie before. They were amazed! Once out of the short movie we waited in line for ice cream treats that were way too big for before dinner and spent some time walking through Miniland. The boys marveled at the details on all the models and devoured their ice cream. We had a bit of back and forth with our crew who were back at the hotel on what we wanted to do for dinner. We could do a restaurant in the park or we could do the buffet back at the hotel. Since our group was split between both locations we didn’t know what was the best decision. We decided to do a bit more of checking out Miniland and soaking in Legoland and then we’d meet back at the hotel. But wait there was ONE more thing I was bummed out that we hadn’t done yet. APPLE FRIES! We never spent much time in the Castle Hill area and were never next to the spot to buy apple fries. I knew it was silly but I really wanted to try them. The boys had their fill of Miniland and we popped them in the stroller and OFF WE WENT marathoning up to Castle Hill. We snagged two servings of apple fires and then booked it back to the hotel to meet up with the rest of our group and laugh at all we packed in to the afternoon. The apple fries were worth it by the way. We had the boys’ birthday dinner at the buffet restaurant. Mom picked up birthday hats and buttons from the front desk and the kids had fun being rambunctious with each other. We were welcome to bring our cupcakes into the restaurant but I didn’t want to bother bringing everything down from our rooms when the kids were being so crazy so we moved our party back to the hotel so the kids could run around and we could set things up for cake and presents. Mom snagged some paper table clothes from the restaurant and we laid everything out and gathered around. My awesome sister had purchased candy molds, made and transported these Lego pieces just for her nephew’s birthday. I saw the molds online but knew I wouldn’t have time to even consider making them so I didn’t bother. Luckily she did because they turned out super cute! We put one homemade candy on top of each cupcake and whala! we had a Lego party fit for a couple of five year olds. Miles very diligently laid out plates and napkins he had picked out at the store. I didn’t plan to buy a bunch of party supplies, just cupcakes in our hotel room to sing Happy Birthday. But when I was out shopping with Miles he spotted the Spiderman plates “Can we get those for my birthday party? !” To which I replied “Sure thing bud.” That was nearly three weeks before our trip, but I packed them along anyway, it’s a good thing I had because Miles definitely wanted those plates to be used for his party. Even while we were singing to him and bringing over his candle to blow out, he was tidying the place settings and making sure each plate had a napkin. Our babies were now five years old! Happy Birthday Graham and Miles! Our vacation was coming to an end. Two full days in the park, it was the right amount of time, although we didn’t get to do everything on my list. The kids were pretty tired and ready to be back in their own beds. 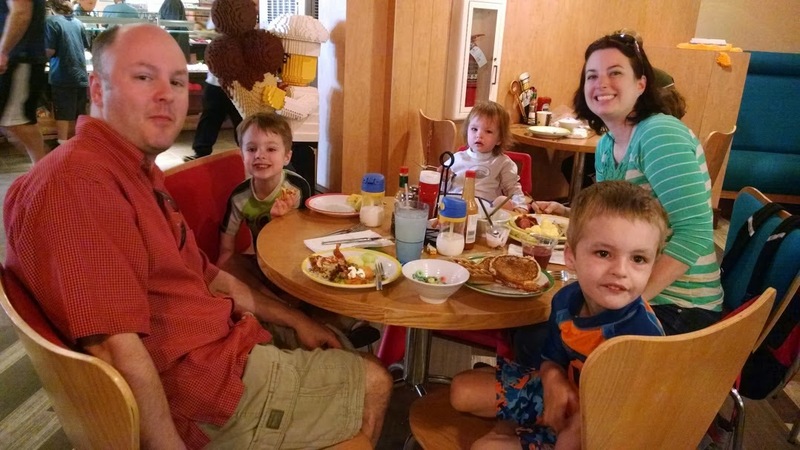 After cake and presents we played with Lego and said our good nights and then in the morning we had a final breakfast downstairs and let a couple adults take the kids to the pool while I stayed behind to pack our room explosion into our suitcases. Joel came back with the kids to finish up our packing and I helped change our wet tots into kids ready to fly on an airplane. And just as quickly as our vacation started, it was over. We had a nice uneventful flight home and although Alice was a bit more wiggly on the way back, she still did great and gave each adult equal attention on the flight. Stickers with Campa were a huge hit. Snacks and books were the other items which killed the most time. I brought our aquadoodle pen and and pad and water wow books but they didn’t take up as much of her attention as I imagined. Luckily there were inflight magazines to examine and windows on both sides of the plan to look out. The boys were kept busy with their leap reader pens, one kindle passed between them and snacks galore. Grandma brought along sticker activity pages and other little treats to keep things fun. We were a busy bunch on the airplane and we lucked out to have zero delays in our travel. The vacation Gods were smiling down on our crew that week! A couple quick tips for traveling with kids. Snacks, snacks, snacks. Packing extra food was great when we needed a diversion or when we were traveling during meal time. I had a straw bottle of water for each kid and had surprises packed in their backpacks they got to discover when we were on the plane (new leap reader books and a couple mini Lego kits). Pack a change of clothes along with a diaper and wipes inside a ziploc bag. Then when you get up during the flight to change a diaper, you have everything you need ready to grab and go and you’re not digging through a diaper bag. Give yourself plenty of time during travel so you’re not rushed. Be sure to use the bathroom before boarding your flight and get one more diaper change in before you go. WHEW! Once back home Joel asked what we were going to do for Alice’s fifth birthday since we did a trip for the boys turing five.